Fennel is an aromatic vegetable that is equally delicious raw or cooked. 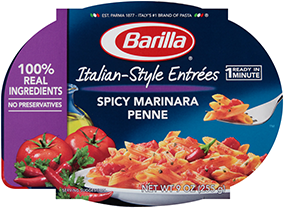 It's also perfect in salads, side dishes and main courses—including this tasty Barilla® ProteinPLUS® spaghetti dish. Our high protein spaghetti is packed with nutrients because it is made of chickpeas, lentils, spelt, oats, semolina, flax seeds and egg whites. In this spaghetti recipe, multigrain pasta with protein provides an earthy undertone for the potent fennel, salty anchovy, and spicy pepper flakes. This light-yet-hearty spaghetti promises to fill you up right and send you on a flavor trip like no other. 1. Bring a large pot of water to a boil, add protein pasta and cook according to package directions. 2. Meanwhile, simmer 2 gently pressed garlic cloves with 2 tablespoons of extra virgin olive oil for 2 minutes. 3. Add 4 anchovies and melt them over medium heat for about two minutes. 4. Add red pepper to taste. 5. Stir in al dente spaghetti and 1/2 cup of cooking water, toss over high heat to combine the flavors. 6. Finish with 2 tablespoons raw extra virgin olive oil, 1/2 cup of Romano cheese and roughly chopped fennel tops to taste.